Baked Brie Bacon and Turkey Melt with Honey Balsamic Glaze. Gooey, silky, crispy, crunchy deli-style turkey melt. 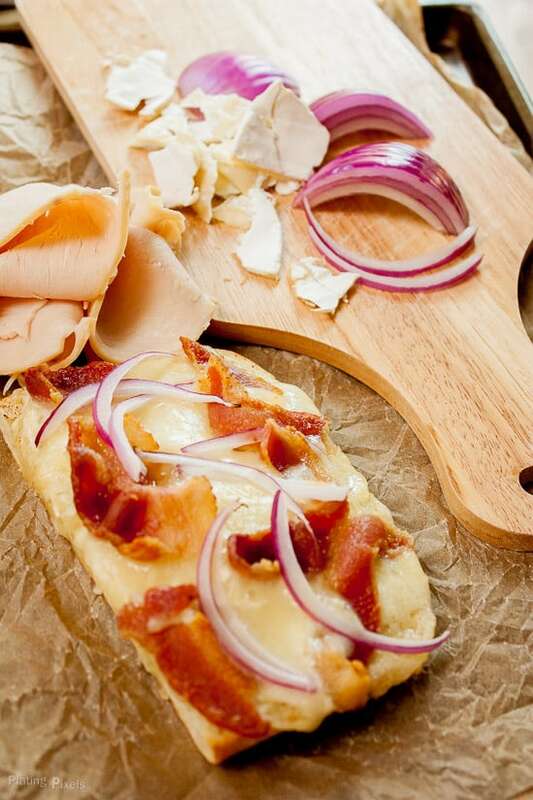 Melted baked brie and bacon added to create a perfect sandwich. Within this post you’ll learn how to make this unique turkey melt sandwich bursting with flavor; as well as how cook down liquids and sauces, either with evaporation or thickening agents. Today I’m starting a new morning ritual; well actually continuing an old one. In a nutshell it involves getting up super early and getting more things done. The alarm clock went off at 6am, and eventually will be closer to 5. To some of you that may not be too early, but given that I don’t go to work till 9:30, that extra roughly 3 hours or prime productive time will be invaluable. It also helps that I just got back from vacation to South Carolina, which is three hours ahead. I snuck that tidbit in there. If you’ve been checking out my social media lately, mainly Instagram, you’ll know I visited Charleston, South Carolina for a cook-off competition. More details on the trip in future posts when I have time to properly elaborate and do this amazing place justice. Of course almost all the extra time will go into the blog. After meditation and brewing a necessary cup of coffee, it was on to editing photos. Surprisingly that’s one of my favorite things about blogging, besides cooking and photography. My inner (slightly OCD) graphic designer gets to come out. I finished editing photos for this recipe, and an upcoming sweet potato breakfast taco recipe you don’t want to miss. Some various other tasks, social media, promotion, and writing, and somehow those three hours fly by. 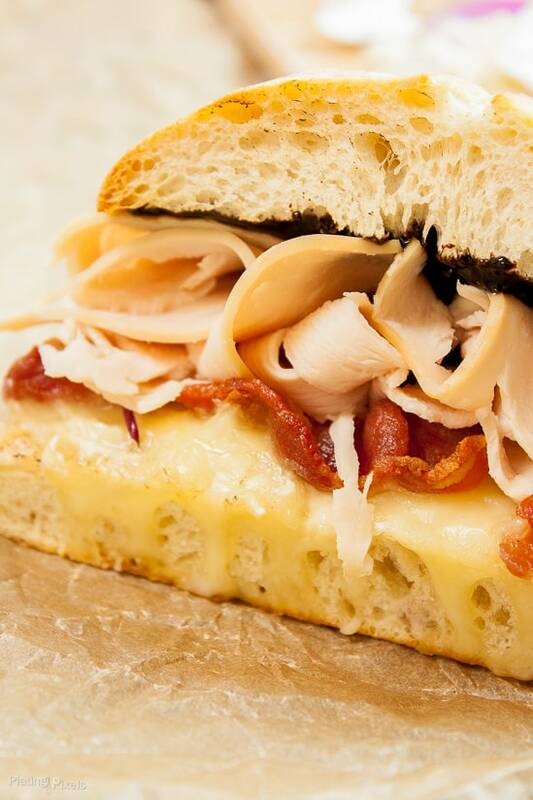 I wish this Baked Brie Bacon and Turkey Melt with Balsamic Glaze was part of my daily ritual too. As in waking up early for a productive routine, simple things can lead to great results. This deceptively simple (7 ingredient) deli-style sandwich may be the most flavorful and unique one you’ve ever had. 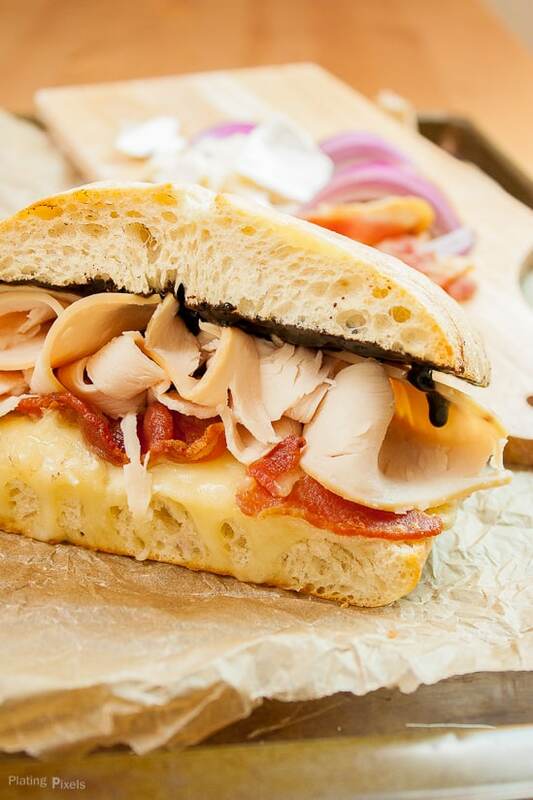 The pairing of turkey, bacon and brie create a rich and savory meal that complements with slightly sweet and tangy sludge-like honey balsamic glaze. You wouldn’t normally think of sludge as a word to describe food, but it’s the most fitting. Cooked down to a thick syrup and easily spread onto the sandwich (see cooking tips below fore more on this). A bit of crunchy red onion adds bite that balances the flavors out. We haven’t even gone into texture, which might be the most unique part. Soft, gooey, silky, crispy, and crunchy all blend together in a symphony of sensations for the mouth. 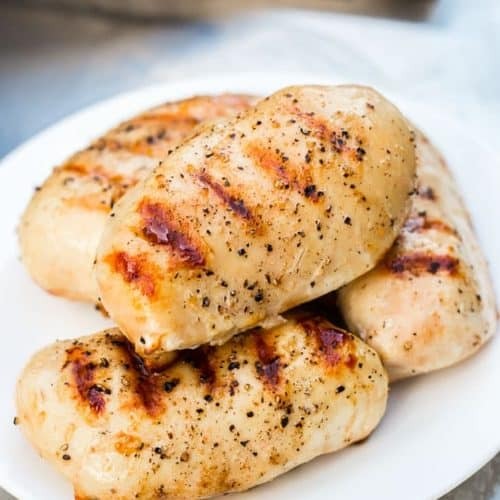 Simple to make and baked to gooey crispy perfection; I hope you can add this to your routine as well. Most liquids, broths, glazes, sauces, and bases can easily be cooked down to thicken up. 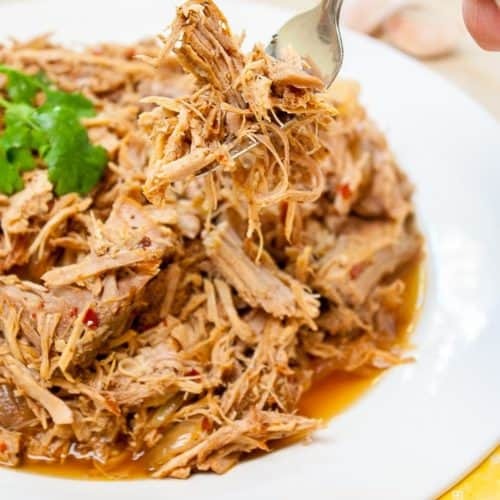 This increases flavor, richness and consistency. 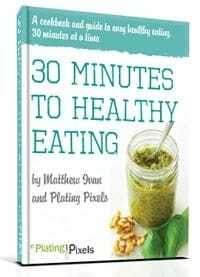 Two easy methods include simmering to evaporate liquid, or using a thickening agent. More details and tips on this Bon Appétit article. To thicken using evaporation. This is is best for glazes, non cream-based sauces and some marinates: Heat over stove at a strong simmer, usually medium-low heat. Be sure to keep open (no lid) so the water molecule can evaporate; leaving just the the thickened base remaining. Cook for desired time, the longer you cook the thicker it gets. Stir and scrape bottom occasionally to prevent sticking. Using a thickening agent. This is best for creams, sauces, soups, custards and gelatins: Cook with added thickening powder in conjunction to heat to thicken even more. Common ingredients include flour, cornstarch, or gelatin. Just a small amount is needed during simmering. Deli-style turkey melt. 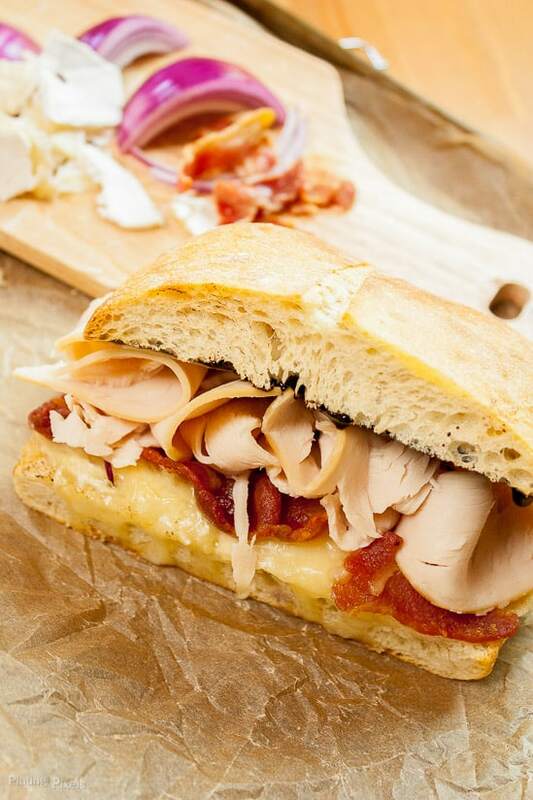 Melted baked brie, turkey and bacon create a perfect sandwich. 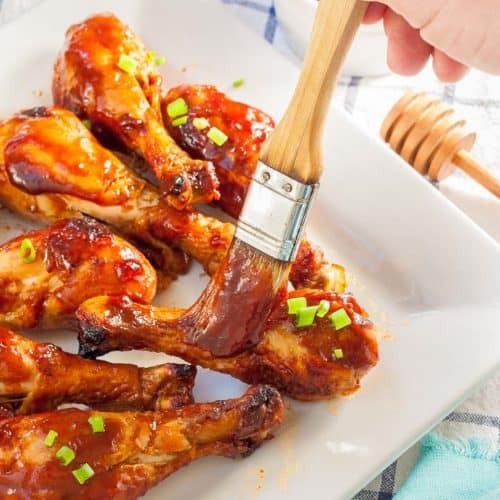 Preheat oven to 425º F. Stir together balsamic vinegar and honey in a non-stick pan over medium heat. Bring to a boil, stirring often, then reduce heat to a low simmer. Cook about 10 minutes to thicken into a syrup; stir often to prevent burning. Remove and let cool. Meanwhile: Cook bacon in a non-stick pan or skillet over medium high for 6–10 minutes to desired doneness; rotating halfway. Drain off excess fat. To prepare sandwich: Evenly divide ingredients between both sandwiches. Spread brie, top with bacon, red onions, and sliced turkey. Place 2 prepared halves, and other halves, on a baking sheet and bake for 10–12 minutes to melt cheese and toast bread. Remove and spread with balsamic glaze. Enjoy your sandwich warm, gooey, crispy and toasty. 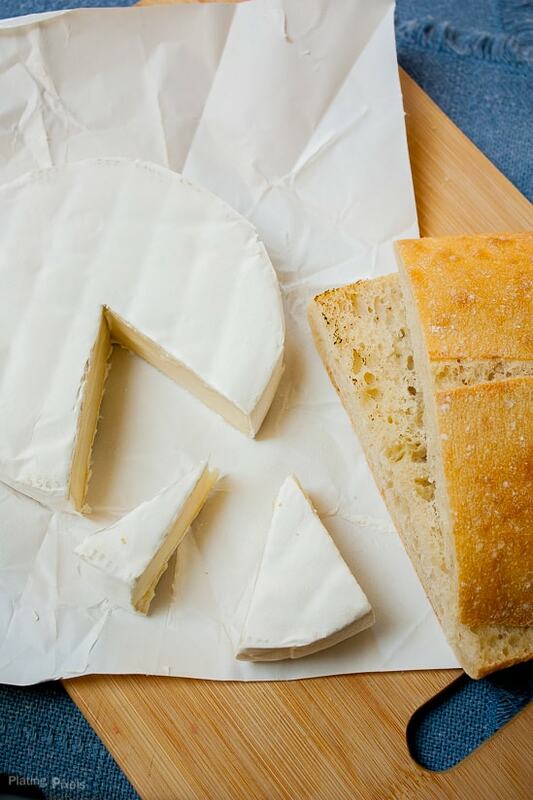 Have you ever tried a sandwich melt using baked brie? This is my kind of sandwich! Seriously, there is nothing better than baked brie. I totally agree! Thanks Chelsea! I’m not a big fan of brie, but this sounds and looks amazing! And I’m trying to do the same thing with my morning routine. It’s definitely a work in progress. Thanks! It takes a bit to get a routine down and stay motivated, but it’s worth it Ashley. If you’re not a fan of brie, I’m sure Jack cheese or white cheddar would work with this. 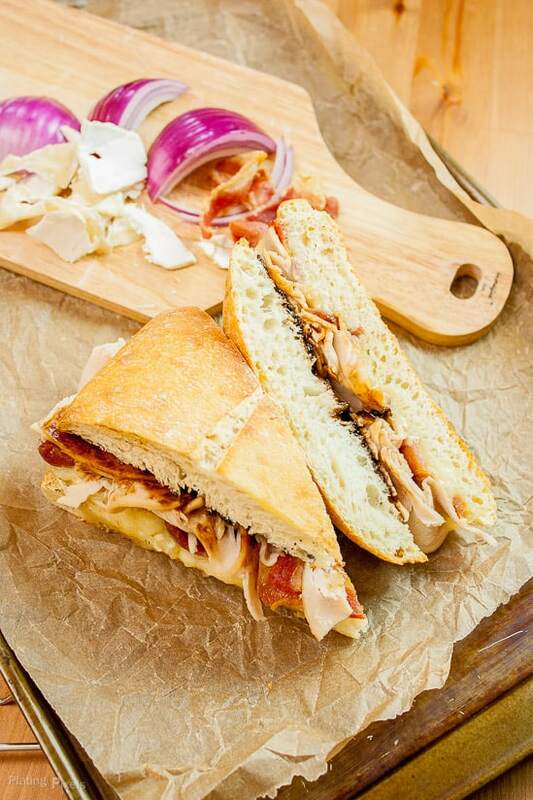 Oh my, this turkey melt looks divine! Yum! Ugh, this sandwich combines some of my all-time favorites! I’d probably leave off the onion, but otherwise, it sounds like perfection! Thanks for sharing! You’re welcome and thank you Katie! Sure you could leave out the onions, I bet it’d still have plenty of flavor with all the other ingredients. This sandwich sure makes my mouth water, and your photos are amazing! It looks like something you’d find in a high-end sandwich shop. Thanks so much Beth! So nice of you to say. Luckily it can easily be made anytime and from home!